DA Form 7375 - also known as the "Commercial Activities Proposed Action Summary" - is a Military form issued and used by the United States Department of the Army. The form - often mistakenly referred to as the DD form 7375 - was last revised on March 1, 2008. Download an up-to-date fillable PDF version of the DA 7375 below or request a copy through the chain of command. 5a. TIME LIMIT WAIVER APPROVED? EDITION OF MAY 97 IS OBSOLETE. command code, and last two letters are SD for "Standard" or SL for "Streamlined" competition. (Ref Data Element A-2). Directorate of Public Works, Directorate of Logistics, etc. (Ref Data Element A-9). a competition. (Ref Data Element A-3). from the pick list provided. (Ref Data Element A-4). be attached to the CPAS and uploaded into DCAMIS. (Ref Data Element A-10). competition. (Ref Data Element A-11). of the DoD CSO deviation request memo and OMB's approval memo must be attached. (Ref Data Element A-13). being competed and must have Competition Coordinator Privileges authorized.) (Ref Data Element A-16). user must enter the number of civilian & military authorized/assigned by location and DoD function. (Ref Data Element 1-1). commercial activity(ies) being competed. These are the DoD Function Codes used as of the FY 2004 Inventory Data Call. Select all DoD functions included in the competition by location and DoD Function Codes. recording the authorizations. (Ref Data Element 1-2). on the Army's TDA by location and DoD function as identified in the public announcement (FebBizOpps.gov). of the column. (Ref Data Element 1-3 and 1-4). number of on-board in the "Total" row at the bottom of the column. intermittent, seasonal, borrowed, detailed, over hire, and any overtime. number of contracts in the "Total" row at the bottom of the column. Block 13. Competition Type: Identify the type of public-private competition process to be used to perform the competition. Select either "Standard" or "Streamlined" competition. (Ref Data Element 1-7). a time limit waiver has been granted for a streamlined competition, the agency must issue a solicitation or create an MEO. by government personnel. (Ref Data Element 1-9). Planning Start Date. (Ref Data Element 1-11). competition. Note: This date must be at least 1 day before the Start Date. (Ref Data Element 1-12). announced. Note: This date must be at least 1 day before the Start Date. (Ref Data Element 1-13). will be announced. This date must be at least 1 day before the Start Date. (Ref Data Element 1-14). and via FebBizOpps.gov to commence the competition. This is the competition start date. (Ref Data Element 1-15). Does not apply to a streamlined competition where a solicitation will not be issued. (Ref Data Element 1-16). Block 20b. Planned PWS Development End Date: Enter the original planned date for completing PWS development. Note: Does not apply to a streamlined competition where a solicitation will not be issued. (Ref Data Element 1-17). issued. (Ref Data Element 1-18). apply to a streamlined competition where a solicitation will not be issued. (Ref Data Element 1-19). a streamlined competition where a solicitation will not be issued. (Ref Data Element 1-20). research has been conducted and the incumbent is the agency. (Ref Data Element 1-21). selected service provider. (Ref Data Element 1-22). 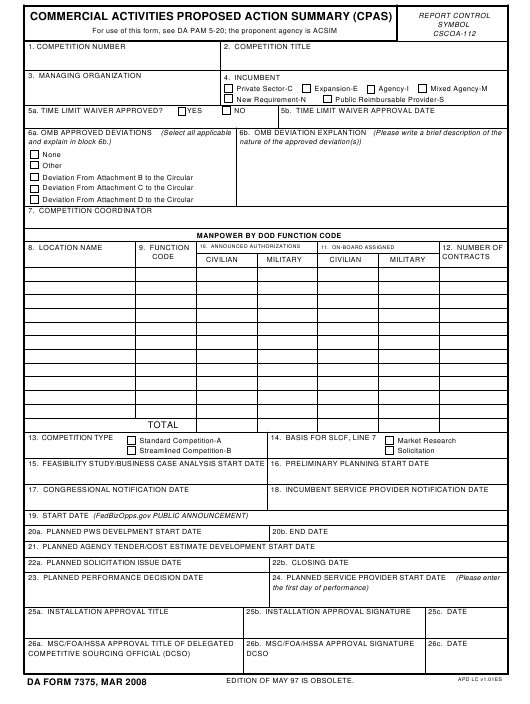 Block 25 (a, b, and c): Installation Approval Title, Signature, and Date. Self Explanatory. Block 26 (a, b, and c): MSC/FOA/HSSA Approval Title, Signature, and Date. Self Explanatory.